I’m home! I flew home Wednesday after spending the past 6 weeks in Virginia helping my Brother in Law and my Nephew. Please note that I came home one day after the Virginia earthquake (which was a surreal experience all on it’s own). I have so much to catch you up on so I think it’s best if I jump right in. My newest design is featured in the Fall issue of Knitcircus. The August Pansy Shawl knit with one skein of Sweet Georgia Cashluxe Sock and has lace knitting on both the right and wrong sides of the work. This particular issue of Knitcircus is the best yet. It’s a great value and the issue is filled with beautiful designs and informative articles. Please check it out! I’ve teamed up with Roxanne of Zen Yarn Garden and we’re hosting our first Mystery Shawl Knit a Long. We have created a dedicated group on ravelry where you can ask 971 questions, chat with other knitters and knit your way through our first KAL. The yarn is spectacular and I enjoyed knitting it very much and I think you will too! Details about joining the KAL can be found here, but you can only join for a limited time. 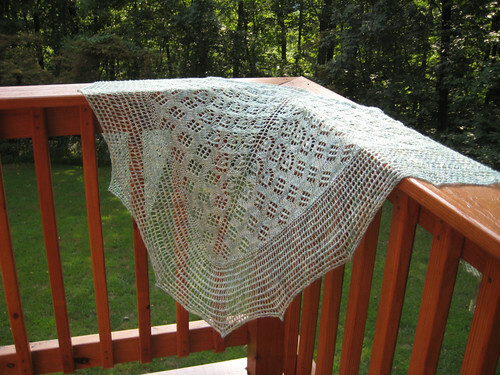 Purchase your yarn and pattern for the Fickle Zen Mystery KAL here. Jennifer of Holiday Yarns has one of the most interesting dyeing techniques that I’ve come across. She has a super secret superhero method of applying color so that it’s tonal but not a solid color. The yarn almost shimmers with color and is a delight to knit with. This particular yarn, called Skinny-Ewe lace is wonderful although it didn’t make me any skinnier. That’s a personal beef though and I’m sure Jennifer is working hard to remedy that particular issue. The kit and pattern will be available in Mid-October. Bacon. There’s nothing quite like getting a catalog in the mail with one of my designs inside the pages. My Simple Swish Bulky Hat was featured in the Knit Picks Fall Catalog! This hat is really that simple and knits up very fast in soft Swish Bulky yarn. That and the model has a much better hat head than I do. 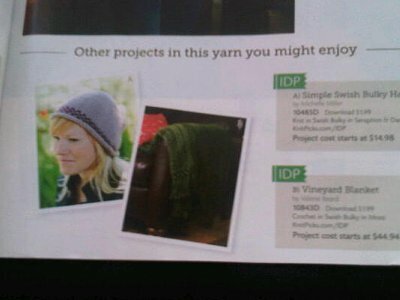 What’s better than finding my pattern featured in a Knit Picks catalog? 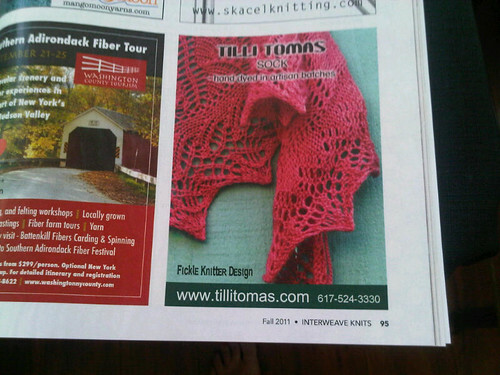 Finding my Flambe Shawl pattern featured in a Tilli Tomas ad for their lovely hand dyed Artisan Sock yarn in the latest issue of Interweave knits! I’d like to thank Chaitanya especially for knitting the sample and taking the beautiful photo that appears in the ad. (I’m going to pinch myself now but I don’t think it will make me any skinnier). For those attending Vogue LA I’ll be selling kits with Flambe Shawl and Artisan Sock yarn in the Fickle Knitter booth #38. Please stop by and say hi and take advantage of my exclusive limited kits. So my husband stops giving me the side eye about all the extra yarn in my studio. Thank you in advance. I met Nancy at June TNNA. She is chic and cute and elegant just like her shop, Noble Knits. I was really excited to participate in a Noble Knits interview and my patterns have been making lots of appearances on the Noble Kntis Facebook page and in the latest Newsletter. Thanks Nancy! The Knitting Club facebook page posts regularly with informative links and has a post about my Tree & Arbor Wrap featured on craftsy.com! Scroll down to July 29th entry to see what facebook members had to say and you can check out the comments on Niseyknits’s pretty craftsy version here. Now if you’ll excuse me I’m going to spend the second day in a row hugging my kid after being away for so long. It’s a good thing she’s off from preschool because that would be awkward what with me hugging her all day in class. Also my book is coming very soon. I don’t know if that should drive me to drink or indulge in chocolate. Or maybe both? Have a great weekend all. You’re a very busy lady! Congratulations on all your wonderful successes. And I’m glad to hear that you’re back home again now. I’m glad to hear that you were able to go back home, and I hope that your family continues to do well.